This was the sort of disgusting blather that these European officials pumped out on a regular basis to make it look like they were empathetic to the people whose lives they were devastating with their mindless economic interventions. History tells us that the likes of Van Rompuy failed to do his job when evaluated by his own criteria. But that didn’t stop him retiring with a sizeable pension. He should have gone to prison for professional incompetence. Two news items caught my attention this week about Greece. The first, concerned the way the Greek banksters are being supported by the state to consficate houses from workers in trouble. As background, this UK Guardian article (July 9, 2018) – If you love Greece, help us get rid of Alexis Tsipras and his zombie party – by former Greek MP Zoe Konstantopoulou, summarised the way that the Greek prime minister and his party (Syriza) has betrayed the Greek people. 1. 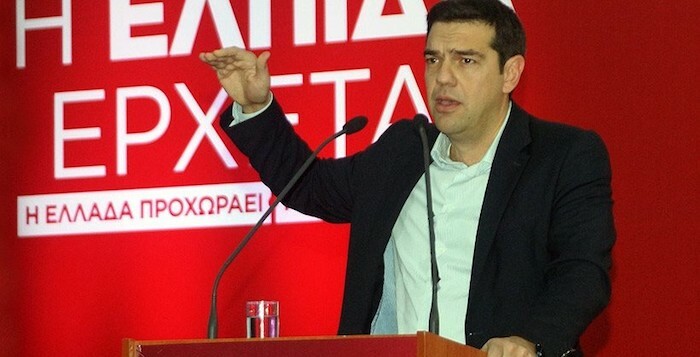 “Tsipras had vowed to destroy media oligarchs” – he reinforced their power. 4, “Tsipras built close relations with Benjamin Netanyahu’s Israel”. 5. He “agreed to sell weapons to Saudi Arabia – a regime that has been accused of bombing children in Yemen”. On January 15, 2015, the Thema news report – Tsipras: “No home will end up in the hands of banks and that’s final” – said it all. Of course, he lied about that. He won office on an anti-austerity, oversaw a referendum that voted to end austerity, and proceeded, unabashed to inflict the sort of austerity that the conservatives would never have dreamed of being able to enforce. The more recent Jacobin article by Stathis Kouvelakis and Costas Lapavitsas (October 6, 2018) – Syriza’s Repressive Turn – shows how far to the right the so-called Greek socialists have become. It provides more detail on the way that Syriza has sided with the banksters against the people. If once Syriza itself raised the slogan “no homes in the hands of banks,” today it is cracking down on protestors trying to stop the auctioning of houses. New laws threaten prison for those who interfere with the auction process — in fact, arrests of the government’s critics have already begun. The article provides a detailed analysis of how bad the Greek banking sector is some 8 years into the crisis. The second article (September 20, 2018) – Historical Monuments and Museums transferred to Greece’s Privatization Fund – was about privatisation of monuments. … Greek Finance Ministry issued a decision ordering the trasnfer several historical sites and buildings, museums, monuments and historical buildings to the Super Privatization Fund. This harks back to 2011 when the article in the Economist Magazine (May 16, 2011) – Sell, Sell, Sell – which referred to renewed calls for an even more expansive privatisation program in Greece than is already under way. I wrote about that in this blog post – I’ll buy the Acropolis – where I indicated I might be interested in purchasing the Acropolis. At this time, the German press had demanded that the Greeks sell their islands and even the Acropolis. This mantra became standard IMF/Europe Finance minister’s talk. The Euro bosses were uncategorical in telling Greece that they would only bail the nation out further if they sold more public assets and impose harsher “structural” reforms. Urgent measures are needed in Greece in order to reach its fiscal targets … [including an] … increase the volume of privatisation ..
… more radical measure: creating an external agency run by the EU to take charge of selling the assets. So think back to Van Rompuy and his ridiculous claims about solidarity and the regular statements coming out of the European Commission about convergence of outcomes. The European Union (particularly the Eurozone) is not even remotely performing according to the official narrative. It is a corporatist, anti-democratic structure that inflicts massive costs on nations while mouthing meaningless epithets about solidarity. Those two strands (banks and privatisation) provide background to the human tragedy that the European Commission and others have created in Greece. 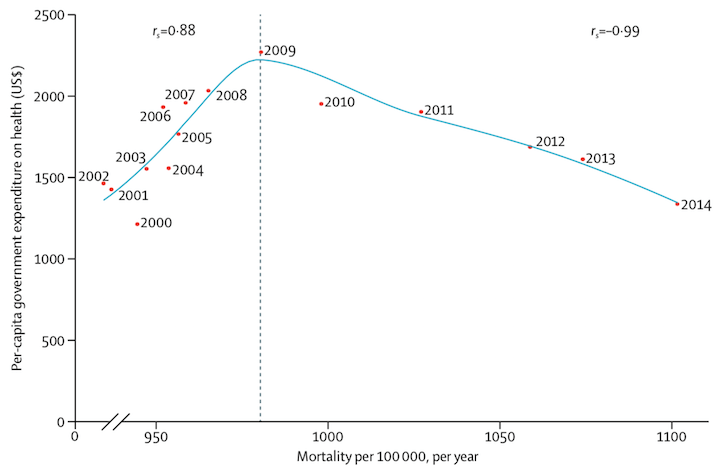 I read a recent article in the British medical journal The Lancet (July 25, 2018) – The burden of disease in Greece, health loss, risk factors, and health financing, 2000–16: an analysis of the Global Burden of Disease Study 2016. The analysis, which reports on a major study of the “negative health consequences” that followed the “substantial contraction of health-care expenditure” which accompanied the austerity programs inflicted on the people by the Troika and its agent – Alex Tsipras’ Syriza. We learn that as a result of the colonisation (my word) of Greece by the Troika, “most of the budget” was allocated to “debt payoff” and as result there was a massive “contraction of national gross domestic product”. Health expenditure fell from 9.8 per cent of GDP in 2008 to 8.1 per cent in 2014. But those figures fail to disclose the full impact because GDP was also contracting quickly over the same period. … the Greek health system was one of the priority areas for … cuts in public spending. Annual government spending on health has reduced by more than €5 billion in 2013 compared with 2009 – a reduction of almost a third in real terms. However, those wanting to deny any association between the imposition of austerity and negative health impacts claimed that the data supporting those conclusions was weak. The study reported in the Lancet article, however, used the comprehensive GBD dataset which is less open to criticism. 2. The “annualised increase from 2010 to 2016” was “five-times greater … with evidence of continuing acceleration” than pre-austerity. It is a stunning indictment of the impacts of austerity. Acceleration of population ageing since 2010 … due to the massive emigration of early to mid-career educated professionals in pursuit of financial stability, in what has been referred to as brain drain. Their further analysis of that possible impact cannot “support ageing” as the “only culprit”. So the economy has lost a cohort of skilled, younger workers which will undermine its future. But the health deterioration is mostly separate from that compositional shift in the population. The contraction in health spending has been damaging though. Since the implementation of the austerity programme, Greece has reduced its ratio of health-care expenditure to GDP to one of the lowest within the EU, with 50% less public hospital funding in 2015 than in 2009 … This reduction has left hospitals with a deficit in basic supplies, while consumers are challenged by transient drug shortages … Concurrently, nearly a quarter of the population lost health insurance from the national health-care programme due to longstanding unemployment, while more than 20% reductions in the minimum wage reduced consumer buying power. They conclude that while it is difficult separating the impacts of the spending cuts from other possible factors (“unhealthy behaviours” etc), the “austerity measures” have accelerated the “steep changes in health loss indicators since 2010”. … the number of individuals with unmet health-care needs nearly doubled since 2010, with a considerable fraction reporting health-care cost as the main reason for not receiving the recommended health-care services … These reports point to a potential additive effect of the economic crisis to existing deficiencies in health services. One of the major responsibilities of government is to ensure health care improves over time as technology makes new treatments possible. In Greece, the Government has deliberately undermined the health of its population by enforcing the policies of the Troika. I wonder if citizens in Germany would tolerate what has been imposed on the people of Greece. I doubt it. More studies will follow with further evidence of the damage the EU and its corporatist mates have inflicted on the nation of Greece. If there was ever any doubt of the need for nations to exit the Eurozone, and the EU and expunge these traitorous faux-Left governments from power, the Greek tragedy is there for all to see. When I hear about Greece, I believe that many communists were massacred around the end of the “2nd World War”. They are still the victims. I met a Greek in the hotel I was staying in, in England. We talked about the situation. He shook my hand at the end of our chat. It felt like I was shaking hands with all the workers of Greece. They should never have joined the EU. They should get out as soon as they can. To be fair, he was forced to do that by the Troika. The actions undertaken by Syriza are only because they (mistakenly) think the consequences of not complying would be even worse. I don’t think it’s fair to label someone as “faux-Left” on that basis. In 1939, Britain and France declared war on Germany when it invaded Poland, even though it certainly meant a big human and economic sacrifice. Now France is hand in hand with Germany in economic war against Greece (and Italy, Spain, Portugal) and a substantial number of British people want the UK to continue to support the EU in its economic destruction of nations. I’m totally ashamed of my country. The EU, via the Troika, has awarded itself the Mandate to govern Greece, in exactly the same way as Britain awarded itself (nominally “was awarded” under the Versailles Treaty, although that device fooled no one) the Mandate to govern what was then Palestine – which it needed to act as a buffer against encroachment by France. (Balfour meanwhile having munificently “granted” worldwide Jewry a national home in what was actually someone else’s homeland, a tract of former Ottoman land (including Jerusalem) inhabited overwhelmingly by arabs, who were of course muslims). The EU is now functioning in a precisely analagous fashion in regard to Greece. And we now see how *that* (predictably) is turning out. What an utter betrayal of all the high-sounding ideals the EU was originally represented as embodying! Sheer cant. A slow-motion train-wreck, heartbreaking to witness. Why was Greece so eager to join the EU, and why was it admitted? I don’t know the answer to either question, but feel impelled to speculate. I surmise that Greece (meaning its governing elite – allegedly corrupt – and its wealthier classes) simply wanted to “get in on the act” – at any price (though Greece was far from alone in the pell-mell rush to join). Perhaps they smelled rich pickings. Perhaps it was national pride – a burning desire not to be excluded from Europe while other (lesser?) nations were applying to join. And then there was Turkey, the arch-enemy, cosying-up to the EU; what if the Turks were admitted while Greece remained out in the cold? In order to be admitted an applicant state had first to fulfill the so-called convergence criteria. Greece was never within shouting-distance of meeting them but was admitted all the same. Why? I don’t know, but possibly because some influential people in Brussels were for some unknown reason no less eager to admit Greece than the Greeks were to be admitted. It was an open secret that the Greeks were cooking the books. Each time they submitted a set of figures “showing” that the criteria were being met which were seen as showing nothing of the kind, they went away and then turned-up again with a suitably-massaged new set until they finally “passed”. Everyone in the know knew it was a transparent fraud but a blind eye was turned and Greece was admitted. In hindsight it of course became obvious that that was the worst disservice not only to the EU but (most of all) to the Greek people themselves that could possibly have been rendered. All of Greece’s subsequent woes are directly attributable to it. And the contortions that the EU and the IMF have been forced to put themselves through, the blatant denial of (lying about?) what the evidence was telling them about its true, terrible, consequences for the Greek nation, the taking-on of the egregious role of arrogant conqueror by the EU, and all the rest of the sorry tale also stemmed from that original crass misjudgment made by the EU, by who knows who with who knows what motive. I must disagree with you Robert about your analogy. There is no *precise* analogy of Palestine with Greece. The troika is not partitioning Greece to set land aside for the occupation of a foreign population. And I question the relevance of Versailles to the current situation. Something terrible is happening but I don’t think what is going on is the same as what took place subsequent to WW1. It is clear that Europe (mainly Germany) is choking Greece while simultaneously blaming them, and subsequently castigating them, for failing to breath. At this point, it takes unbelivable amounts of moralizing about past misbehaviour on the side of Greece’s political caste and an almost inhuman disregard for the suffering of the greek people to not be apalled by the sado-monetary torture the country is being put through. Sadly, since I live and work in Germany, I can confirm that both the moralizing and the diregard are not only present, but betting on them is the safest road to electoral success on that subject. To anybody interested in the inner machinations of the Troika and the degree of plain politcal/economical malpractice at the highest level of the EU I can only recommend Giannis Varoufakis political memoirs “Adults in the room”. I’m not sure he’s all in in regards of MMT, but he appeared to me to be one of the only players in the Great Greek Tragedy (can we coin this term GGC?) that at least had the competence to recognize the “extend and pretend” approach of the Troika and the courage to call them out on their obtuseness. It is very sad that he lost Tspiras ear and that the farce thus continues unabated. “There is no *precise* analogy of Palestine with Greece”. OK, delete “precisely” (that word was superfluous). There is nonetheless *an* analogy IMO, whether you choose to accept it is up to you. “The troika is not partitioning Greece to set land aside for the occupation of a foreign population”. Neither did Britain in Palestine. “And I question the relevance of Versailles to the current situation”. *Of course* Versailles as such has nothing directly to do with Greece, nor was the analogy I was drawing “between Palestine and Greece”, It was in point of fact between the *behaviour* of the respective sets of actors in what seem to me two strikingly similar power-plays, namely the awarding to oneself of a mandate to assume control over other people’s countries. In both cases equally a flagrant abuse of power. “I don’t think what is going on is the same as what took place subsequent to WW1”. If you read what I actually wrote you’ll see that I never suggested it was “the same”, but rather *in certain respects* (elaborated above) analogous. Literally speaking, not even remotely “the same”. I try to not be xenophobic, but after more than a century and a half of this Prussian behavior it’s becoming hard. Thank you for posting and keeping me honest. As to Varoufakis, he still advocates for Euroland reform instead of recognizing basic things like that there will never be an optimal economic zone or that there will never be money transfers, so fat chance of him knowing what MMT is. Varoufakis’s position on taxation vis-a-vis that between sovereign fiat currency systems and the eurozone is unclear. He segues from one to the other without missing a beat and, hence, confuses the reader. Schaeuble was not obtuse. He knew exactly what he was doing and it was in the interests of some ideal Teutonic enterprise with order at the center. That he was obsessed with order is not surprising. He thought it best that Greece leave the eurozone, say, for five years, but the Greeks did not seem to agree. They seemed to think that leaving the euro was akin to leaving the EU, which they did not want to do. But it would not have been, as the two are not identical; related but not identical. One of the most awful statements about so-called European ‘solidarity’ (not!) came from Tusk in relation to Greece paying back debts to the ECB. I think Bill reported about it at the time. Tusk simply and horrifically referred to the Greek payments as ‘solidarty’ with Europe. This is indicative of the the uber-monetisation of societies where all values are expressed in terms of exchange value. The underlying conditions of life are entirely unconnected, it seems! So we have Tusk, with his cheeky smile and pseudo-progressive, liberal surface, coming out with this thuggish statement worthy of a mafioso. The second world war makes the most sense when viewed as the development of an extreme right wing reaction (fascism) to the growing momentum of socialism. The international fascist cabal have simply disguised themselves now and will not be satisfied until they achieve perfect and global scale control. With many minions like Tsipras in power (in theory at least), and with control of the state apparatus, the work is relatively easy today. Usury is solidarity, it’s right there in the bible and another christian value we must save from the invaders. I probably shouldn’t write sarcasm when I’m pissed off. I guess this all stems from a determination by Greece to stay in the EU currency. Once they chose that, all the rest pretty much follows. The question then is, why is there such political consensus within Greece against Greece switching back to the Drachma? I guess this is much like how in the Scottish independence debate, they wouldn’t take the plunge and form a Scottish currency (and so their independence plans were a fiasco). I’m surprised that countries don’t look to historical success stories with newly created currencies. The Deutsch Mark’s creation in 1948 is a great example of such a success. Stone:I guess this all stems from a determination by Greece to stay in the EU currency. Once they chose that, all the rest pretty much follows. The question then is, why is there such political consensus within Greece against Greece switching back to the Drachma? There isn’t. Or wasn’t. The primary blame for Greece’s plight is on Alex Tsipras’s shoulders, and he showed himself to be an economic illiterate – who doesn’t know how much he doesn’t know. His worst and most decisive action was (madly) defying the landslide result of referendum he had called. All the polls I knew of showed that the Greeks were the most anti-Euro population in the Eurozone. The consensus is/was an elite consensus, that unfortunately included most of a leftist, populist, socialist party – that again showed itself to be economically illiterate. Good at spouting words, but not in understanding what they were saying. A sad state for a nation that created the word and concept of philosophy, whose thought the rest of humanity owes an immense debt. I think the pop-philosopher Zizek – who often is a bit too new agey and post-modern for me – does put it eloquently when he says that these IMF, Macron, Syrizia, centrist types who say that “we can muddle through”, “with a bit of tweeking we can save the system”, “things don’t need to change that much – just some privatization and structural reform” are hopelessly utopian. It is naively utopian to think that Greece – or Europe in general – can carry on as it is without some big political disruption. It will come. Tusk has always been a liberal. Since 1980 when he entered politics as one of the founders of Independent Students Union (NZS). He was a member of Liberal-Democratic Congress in the 1980s, an organisation offering a liberal alternative to decaying Marxist-Leninist ideology. These guys really believe that relations between humans should be greatly reduced to market transactions (“sell-buy”) and everything else is a “cultural tradition”. “Free market will liberate us”. In this case Tusk identifies himself with Kaszubi (an ethnic Slavic group which is usually aligned with the Polish but in my view has strong elements of German culture). This should explain why he is against nation-states and he wastes no time weakening and dismantling them. In Europe (as you must know) the definition of national identity is very narrow. A person who speaks Polish but is not Roman Catholic is not Polish (it is irrelevant whether that person really wants to follow the religion, it is about the identity). Kaszubi are Catholic but they are not 100% Polish. After the initial (carefully engineered by propaganda outlets) euphoria about joining the EU (in 2004), Tusk’s view have been rejected by the majority of Poles who elected a national-catholic party PiS. This doesn’t extend to a so-called “middle class”, I have a lot of Polish friends who are liberals. They hate the state because it comes with the burden of Austro-Hungarian bureaucracy (think about Franz Kafka or Jaroslav Hašek, the absurdity of this system has been well preserved in the communist cultural refrigerator). Even worse – the nation-state resembles the corrupt communist stuff from before the 1989. Now after a few years of so-called “good change” introduced by the PiS party, it also resembles the semi-fascist Polish state from the 1930s. For the majority the only alternative in Europe is between a dodgy nationalism bordering fascism and the liberalism. There is no third option. People may see that Euro is not working and austerity is bad but the only realistic “other” (non fascist) option for them is more of the same – the EU replacing the nation-state and the “market” replacing the communist party. The state is inherently corrupt and prone to be taken over by fascists so there should be as little of it as possible. I used to believe in this stuff, too, until I saw the true social cost of this cult. Tusk is therefore liberating Greeks from the oppression of a socialist state. “It became necessary to destroy the town to save it.” No matter how much “correct” framing is introduced in the teaching of MMT, this will not work with these people. Who is going to win the next elections in Greece? The New Democracy, the conservative liberals. In Poland if one believes in monetary sovereignty enabling active fiscal policy, it is Mateusz Morawiecki, a former banker and current PM, a staunch nationalist, not any of the brainless social-democrats who are in fact just liberals pretending to care about poverty by handing over breadcrumbs falling from the overlord’s table. I am quite pessimistic but this does to mean that we don’t have the moral duty to speak about other possibilities. I can’t say much about what you say on Varoufakis view, but he did postulate in his book that he favored Greece leaving the Monetary Union over a new “Rettungspaket” that lead nowhere. I agree that the Greeks might have confounded the issue with leaving the EU altogether. As for Schäuble, I do admit that he always made it very clear that he wanted Greece out. Of course he was selling it as a timeout, but some how I just don’t see him welcoming them back with open arms. What is thoroughly unacceptable is his failure to communicate this openly because it collided with Merkel’s position, trying instead to permanently paint the picture of the lazy, frugal greek living at the expense of the hard working german. Once this idea is in the heads of the electorate, it makes it very difficult to sell any kind of economic relief for Greece to the public. don’t be, Pablo. Many Germans are very ashamed for what is happening in (especially in southern) Europe right now. I think that the general public here feels the EU is a force of good and for european integration, but fail to see the economic quagmire designed into it from it’s inception. To be honest, this whole mess has put many of us in almost impossible situations. I, for example, can’t decide if I want Salvini to succesfully fight the austerity dictate of the EU or not, him being an absolutely abhorrent person and at least tolerant/sympathetic of fascist tendencies if not a fascist himself. Or the whole Brexit mess (although it might and possibly will end up being a blessing in disguise in the long run) I’d love the liars an con-men of UKIP and the Tory-Party to pay the political price for their behavior, but I don’t want the british people to suffer for it. Agreed Salvini’s politics are odious but – for the time being at least – he’s not calling the shots (not he alone, that is). The government of which he is but one member appears to have adopted a common line – ie to put two fingers up to the Commission – to which all are party. Which – they or the Commission – will give way remains to be seen but surely you (in common it seems with most others here) would unequivocally adopt the same line as Bill’s in hoping that the Italians will stick to their guns whatever sh– gets thrown at them? And as to Brexit, doesn’t the same apply? Extricating Britain from the EU’s tentacles was always going to be a messy business whoever got lumbered with negotiating it (and bear in mind that the alternative government (Labour) are every bit as internally-divided as are the incumbent one (Tories) and that *both* are equally committed to honouring the referendum vote). You surely aren’t hinting, are you, that Bill’s analysis isn’t well-grounded and his conclusion inescapable – ie the sooner Britain takes itself out of the EU (lock, stock and barrel) the better. For my own part that’s been my view all along, and the antics of Farrell and some others seem entirely (like, for the time being, Salvini’s politics) irrelevant to the main issue. Rationally, I know that. It’s the old story of the burgoise fighting the class struggle with racism and xenophobia as tools of distraction. I suppose I could easily be blaming the English or the French if history was a just a little bit different. I just meant that it’s important to hear German voices as well so that, at the chaotic end of this mess, whatever decade that is in, we don’t carry the same resentments that will be used against the workers again. I don’t think I have the tools to critzice Bill on his economic analysis. That would be pretty megalomaniac for an engineer without the proper background and studies. Furthermore, I don’t see any fault in it and agree entirely. However, I think I am more fearful of the political backlash that might follow than he seems to be. They say a broken clock is right twice a day and I belive this is the case with Salvini. Just like I said before, I welcome challenging the Commission, but fear what Salvini would do next if he emerges the unlikely victor. As for him being the junior partner, well, that doesn’t reassure me one bit. Unfortunately, Salvini is twice the manipulator any of the amateurs of Cinque Stelle is and has a party willing, almost yearning, to fall in line with their “leader”. Thus was always the advantage of fascists over the internally divided democratic parties. Throw the migrant crisis into the mix in a country where a worringly high percentage of the population has shown depressingly high acceptance to far right, fascistoid ideas and the situatition might turn sour in the blink of an eye. Regarding Brexit, I find the irish border issue to be more sensitive than most people think, as there was literally civil war in the island a mere two decades ago. Right now, there is no plan to avoid a hard border and the corresponding checks in a still highly volatile environment. I do concede, however, that I might be blowing this one out of proportion. Given that the UK retained its currency and central bank (BoE) and that it is in the stability and growth pact, but are not subject to the penalties for breaking it, I guess I thought they had the sweeter part of the deal and there was no need to risk it anyway. In contrast to e.g. Greece, the pain inflicted through austerity to its population and the sele-off of public goods was entirely home-made. Then again, I might be missing a decisive point and am always open to a better argument. The money men, the gangsters, the banksters and allied ruling elites effectively now control all the governments, main political parties, parliaments, the bureaucracy, the institutions, the mass media and the democratic processes and every few years dangle the political carrots of their choosing in front of the donkey electorates. Sometimes the donkey reaches for the carrot in the centre or the left or the right. The donkey whines a lot because life is getting harder, probably suspects he or she is being duped but still fails to fully appreciate his or her true predicament or to bother with freeing him or herself. The poor donkey will likely end his or her days in the knackery after a brutal life of abuse and toil and the increasingly fat master will get on another donkey. I too am a bit pessimistic at the moment.